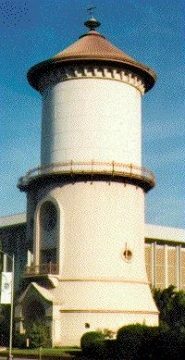 The 250,000-gallon Water Tower was part of the Fresno water system from 1894 to 1963. George W. Maher of Chicago was commissioned to design the Water Tower by the Chicago investors who owned the Fresno Water Company. The design called for a library on the second and third floors, which never was installed. The Water Tower is in the National Register of Historic Places.